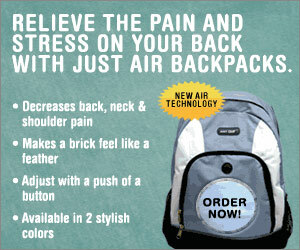 Experience the health benefits of a cushion of air with the Just Air Backpacks. Their patented breakthrough system uses a cushion of air to evenly distribute weight across your back and shoulders. Just Air backpacks protect you and your family from injury and stress. You can choose from either the Black or Powder Blue Just Air Backpacks today.